An editor has vowed her daily newspaper will remain “part of the fabric” of its community after a move to a new “21st century” out-of-town base. 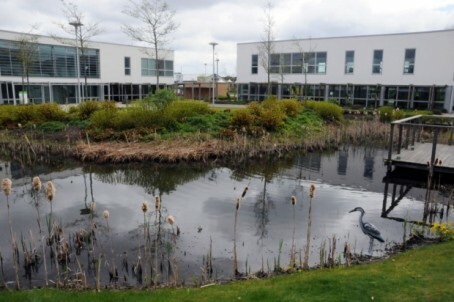 Staff at the Sunderland Echo have completed the switch to their new offices at Rainton Bridge, approximately eight-and-a-half miles from the city centre, after a 15-month long search. The new headquarters, pictured below, lie just over six miles from the Echo’s Pennywell home of 40 years, close to the town of Houghton-le-Spring. While still on patch, the move out of Sunderland has attracted criticism from Echo readers on its website, with commenters claiming the paper should be “supporting the city economy”. Editorial director Joy Yates said: “The paper has a long and proud tradition of bringing readers news and views from across Wearside, as well as being a voice for the community. As part of the move the Echo’s historic clock, which hung outside the newspaper’s Bridge Street and Pennywell offices for more than eighty years, has been donated to Beamish Museum. The Sunderland Antiquarian Society has now also taken over guardianship of the Echo’s archives. My “commitment” would be to that magnificent heron contemplating its fish supper. At least it can keep a close eye on what’s going on – unlike the exiled newspaper staff in their chilly out-of-town “new home”. Good luck one and all. The old office wasn’t exactly city centre, being on a far-flung industrial/retail park at the far end of the suburbs. Not exactly the kind of place readers or advertisers could just call in to. It was a lot closer to the residential areas of Sunderland than Rainton Bridge, though. Maybe they’ll improve coverage of the districts outside the city itself now? Nothing like having grass roots reporters pounding the beats on their own patches – ha! Not even a shopfront presence in the centre of town for advertisements and a reporters desk and computer ?? A vow that’s not worth the cheap newsprint it is printed on.